BTEC Engineering Students Put Their skills to the Test! Our Sixth Form BTEC Engineering students have had the brilliant chance to work at the Amberly Working Museum as part of their rigorous studies. 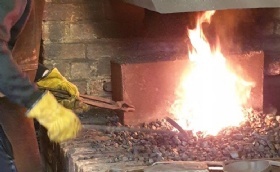 They have worked with the Museum Blacksmith, learning how to perform heat treatment metal work exercises and more! A fun time has been had by all, and not to mention some rather valuable life skills.